I’m not really sure how to help with this issue. Did it actually explode into a fireball? Did it catch your house on fire? If so, please call the fire department, do not google search. I kid, I kid. 🙂 That search term did give me a giggle the other day when I saw it pop up. In my opinon, the best way to preserve zucchini is freezing. Zucchini is a low-acid vegetable so you cannot use the water bath canning method. Pressure canning is required. Personally I am wary of the pressure canner. It’s a little more difficult/complicated than just water bath canning. Therefore I stick with freezing. Frozen zucchini is good to throw in soups and stews in the winter. And you can also shred it and freeze it to use in baked goods. See my post on freezing zucchini. Yes and no. Chocolate fondue can be easily made in a crock pot. See my post on chocolate fondue. Cheese fondue is a little different. I recommend making the cheese fondue in a pot on the stove and then transferring it to a crock pot once it is finished and ready for eating. See my post on cheese fondue. But bottom line is that you do not need a special fondue pot to make cheese and chocolate fondue at home! Cream cheese frosting is lumpy when the cream cheese is too cold. Let your cream cheese blocks sit on the counter for a few hours so they can come to room temperature before attempting to make frosting. The same rule applies to butter or margarine for regular buttercream frosting. A trick I learned from a magazine (I think it was Martha Stewart) to get a stick of butter to warm up faster is to cut the stick up into tablespoons and lay them out flat on a plate. They will warm up in about 20 minutes. In my opinion organic soy lecithin is safe. If soy lecithin is labeled as “organic” then it has come from non-GMO organic soybeans and it not extracted with hexane, a potentially harmful chemical. For more details, read my post on soy lecithin. Yes ester of wood rosin is vegetarian. Ester of wood rosin comes from plants, specifically pine trees. See this short blurb from Oregon State and also my post on ester of wood rosin. Making cornbread from scratch is really easy. It’s one of the first things I made from scratch when I started trying to get away from pre-packaged foods. First you need to buy some cornmeal. This is usually in the baking aisle at the grocery store by the flour. I like the Quaker brand in the round container, or I’ll get it from the bulk bins at Whole Foods. Sometimes the container of cornmeal will have a recipe on the side. I usually just follow that. See also my post on easy cornbread with a simple recipe. The recipe can easily be converted to a plant-based formula, or I like this one at PPK. That’s probably enough answers for today. If I see any more interesting search terms pop up, I’ll start compiling them for Part 2. 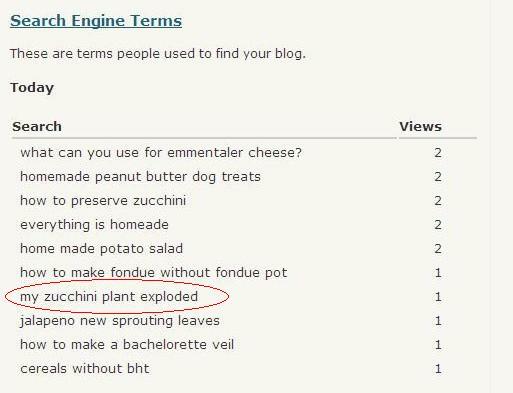 I will say that I’ve had a couple of search terms pop up that are very funny yet wildly inappropriate. I don’t know if they will ever see the light of day!